The politician believes the president and premier should have held a meeting with party leaders. 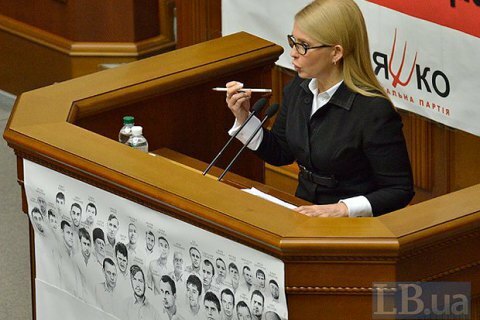 The Leader of Batkivshchyna party Yulia Tymoshenko demanded to change the current governance system, which she considers inefficient. "I demand that we return to strategic, efficient, quality management of the country and stop the nonsense at the level of all branches of government. We must start working as a parliamentary-presidential form of government rather than a pack of corruptioners lobbying their interests. I urge the change governance strategy, change the attitude to the country," Tymoshenko said on 6 September as quoted by her press office. In Tymoshenko's view, a new parliamentary session should have started with a meeting with the participation of the president, prime minister, ministers, leaders of parliamentary factions, which was necessary to discuss the budget resolution. "Meanwhile, chairmen of the factions representing parliamentary republic, talk about things that are crucial for the nation in a nearly empty room," protested Tymoshenko. Earlier in the day, Verkhovna Rada has started the sixth session. President Petro Poroshenko addressed the house with an annual "state of the nation" report.